Regenerate and Hydrate | All skin types | Sensitive and Problematic skin. This is a fast-absorbing formula instantly combats rough and dry skin. Made with Organic Shea Butter and Pure Vit. E for maximum protection, skin feels moisturised without a greasy feeling. 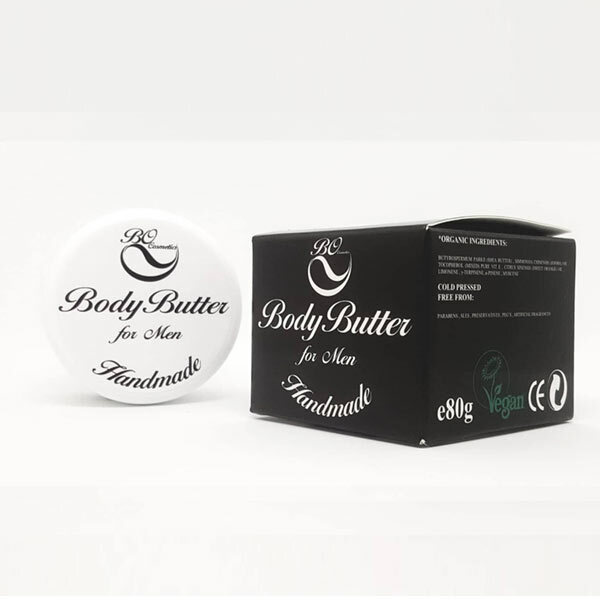 Body Butter for Men instantly improves skin’s hydration and protects it from the day’s exposure to environmental toxins that lead to dryness, irritation and inflammation. This silky butter can be re-applied to skin to maximise its calming and soothing properties and to provide an additional barrier against damage. To provide after-sun relief with cooling, pacifying Shea butter, place body butter in the refrigerator. Then, gently smooth the cooled cream onto the sunburned areas of skin. Reapply as desired for optimum comfort. This body butter is pure and gentle enough to be used daily on the face. Re-apply to troubled spots throughout the day if skin begins to feel inflamed, itchy, flakey and rough. For the most visible results, use Body Butter for Men daily after cleansing, on moist skin. Apply all over the body or on desired areas using smooth, even strokes to create a thin, moisturising barrier. Safety Information: Avoid contact with eyes or broken skin. If any discomfort or irritation occurs discontinue the use. The consistency of the natural ingredients contained in our products can change under the influence of heat or cold. The appearance of cosmetics may be slightly changed, but it will not affect the quality or benefits of using them. Indication: Reaction to a given raw material is an individual matter. Before using any product, it is recommended to perform a test on a small piece of skin to eliminate adverse reactions.